From the UNESCO monument of Epikouros Apollo Temple, to the ancient Mantineia, Arcadia boasts a huge number of archaeological sites waiting for you to discover. The mountainous region of Arcadia conceals long rivers, gorges, endless trails and lush vegetation, offering unforgetable relaxing and admiring moments! 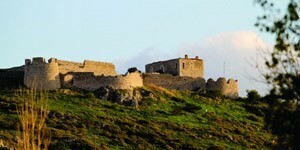 Built on the top of Arcadian hills, the castles of Arcadia protect the whole area and offer astonishing views. Don't miss out! 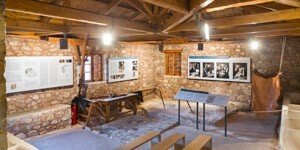 Full of mountains, rivers and very long history, Arcadia hosts a beautiful archaeological museum in Tripoli and a unique hydropower museum in Dimitsana. Visit them and learn what happened in this area many years ago. From the capital city of Tripoli to the mountainous villages of Dimitsana, Stemnitsa and Vitina in Arcadia there are endless choices for relaxation and connection with the pure nature of the whole area. Hidden in the gorges and the rocks, the monasteries of Arcadia are waiting theis visitors to be discovered. Arcadia is geographically situated in the centre of Peloponnese and is washed by the Argolis Gulf and Myrto Sea. It has an exceptional multifarious natural relief, exceptionally beautiful landscapes, regions of an intense archaeological interest and historic locations. It was first settled by the Arcadians, one of the oldest peoples in the Peloponnese, who founded significant cities and it was also the place where the Greeks achieved their first victory during the War of Independence. Tripoli is the capital of the prefecture of Arcadia. Built in the centre of a wooded plateau, Tripoli is one of the most important agricultural, commercial and transportation hubs in Peloponnese. The city is a place of natural contrasts. Due to its position, it can satisfy even the most demanding visitors, as it offers enchanting landscapes and resorts combined with mountain and sea. Arcadia is rich with cultural and historical monuments and landmarks and offers too many selections to each visitor. 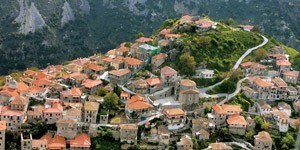 Visit “Mount Athos” of Peloponnese and discover a unique natural environment in mount Parnon or walk along Lousios River. 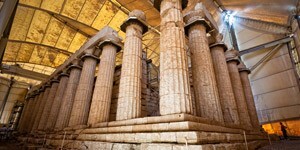 Visit Ancient Gortyna, right next to Lousios riverside where there are hot springs and the sanctuary of god Asclepius. Admire the temple of Apollo standing lonely on the mountains and get to know the unique ability of the locals to give life to stone. Visit the rough shores of Tsakonia, where the Tsakonian dialect is spoken for thousands of years. Monuments of mostly –but not solely- religious interest are the Monasteries in the Lousios Ravine, built in the rocks. 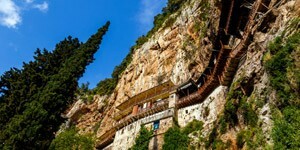 The best-known ones are Filosofou Monastery, Timiou Prodromou [St. John the Forerunner] Monastery and Kalamiou Monastery. There are also 25 hermitages dug into the rocks that are quite an impressive sight! The capital of the Prefecture of Arcadia, Tripoli, is 157km (about 2 hours driving) from Athens following the National Highway Athens-Kalamata. As an indication, Tripoli is 56km from Nafplio, 215km from Patra and 58km from Sparta. Your trip by car will be relatively comfortable as the road network is in a very good condition. There are daily buses from Athens to Tripoli. The Arcadian buses also connect the prefecture with other large cities of Peloponnesus. The bus trip from Athens to Tripoli is about 2 hours and buses depart from Kifissos KTEL Bus Station in Athens. For more information please visit the KTEL Arcadias website (http://www.ktelarkadias.gr only in Greek language). The closest airport to the Prefecture of Arcadia is the Kalamata Airport which is located 86km from Tripoli and the International airport of Athens which is 190km from Tripoli, about 2 hours driving. Unfortunately there is no railway connection with the prefecture of Arcadia. 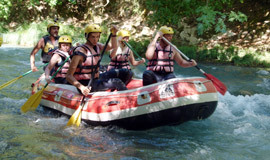 Visit the Lousios River in the heart of Peloponnese and live an unforgettable Rafting Experience with your friends and family!